Shot my first 49 reloads today! Why not 50? Well, the 50th round was pretty difficult to get chambered. I'm unsure why...I measured the COAL, diameter of the base, diameter of the neck, and they're all below SAAMI max. I measured all cases after resizing and after seating to ensure they were not over SAAMI. All the other 49 rounds chambered smoothly. So I'm unsure about that last one...but I didn't shoot it just to be safe. Anyway, it was extremely rewarding to know I shot my own reloads and they performed pretty good. Accuracy was so so for the first 25 rounds, I think it was my nerves. Plus this range is known to have wobbly tables which has impacted my accuracy before. I did get some nice groups in the last 25 rounds. The lower grain rounds left a lot of soot on the empty case. I've read this is due to the powder not burning completely or as rapidly as it should. The higher grain rounds were also a little sooty, but not nearly as bad. I have a friend that shoots in the 44gr. range (Almost 3gr. over book) and he never has this problem. I am hesitant to shoot that hot, especially while I'm getting started. Here's an image of my best groups. 38gr on the left, 39 in the middle, 40 on the right. I think I am measuring those correctly? 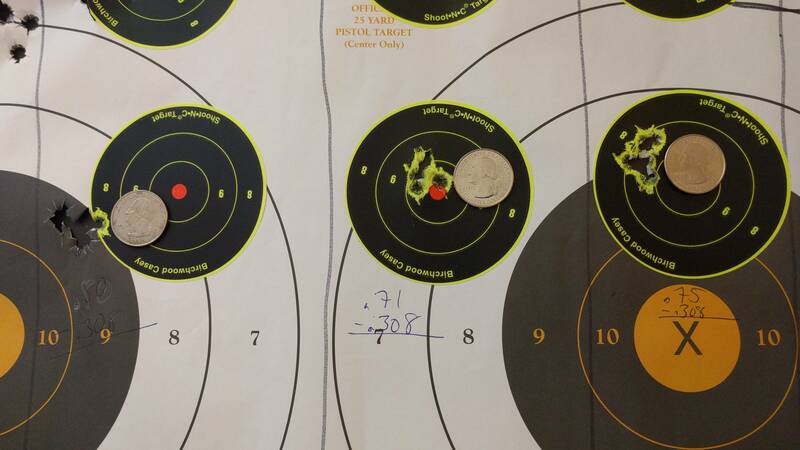 Measured outside to outside of the farthest holes based on what I can tell, then subtracted the bullet diameter. That leaves me with half-MOA accuracy at 100 rounds with 5 shot groups which is nothing to be disappointed about, especially for my first go 'round at this. Anyway just wanted to share my experience and thank all of you for your contributions to this forum. There's a lot of good information out there and I love reading and researching about this. I'm very excited to have this as a new hobby and look forward to growing my expertise and ability. I am open to any thoughts, suggestions, comments, etc based on what I've posted. The reason you get such wide variation in published data is that .308 brass is very different from brand to brand. Weigh your empty unprimed PPU cases to get a baseline. Weigh at least five cases to determine an average empty weight. From what I see on target I suggest you load 39.0 grains and call it good. Maybe 39.5. It's always nice to see groups that don't change in size much over a rather large range of charge weights. Military brass, which I believe includes PPU, usually weighs around 179 grains empty and unprimed. It has substantially less internal case capacity and will not tolerate the larger charge weights published for commercial brass. I would consider 41.0 to 41.5 grains of RE-15 as maximum when loading Lake City or IMI brass and 175 grain SMK's. JoeMal. Nice work. All too often you'll see guys going with .2gr increments which is a waist of components in the .308 Win. Nice to see you stared with 1gr increments to find your nod first. Your group size through a 3 grain spread is also a VERY GOOD SIGN. It tells you that your accuracy is not going to be effected very much by normal changing conditions. You can now start to find the most accurate load. I didn't notice what type of sizing you were using. If you are full length sizing you could shrink your best group possibly by 50% by going with some sort of neck only sizing. Neck only sizing can make rounds fit very closely though so if fast reliable fallow up shots are required you may not want to go that route. The only hunting rifles that I neck only size for is my groundhog gun. It is of course a bolt action also. Other tuning options are trying different seating lengths. You could also try different primers. Sometimes the sooty neck thing can be greatly improved with case neck annealing. Group Measuring: There are a few ways to measure group size. I usually measure extreme spread between the "center" of the bullet holes. Don't over complicate things. Cover the basics and you'll be ok. Welcome to the successful reloader club. Your one case didn't chamber because the shoulder wasn't moved back enough. I bought a headspace gauge to help dual in my die. Right now I'm just using the recommended instructions per RCBS but I understand that isn't the best route for brass life. I am full length resizing for now until I get my feet under me. I may neck size down the road. I may also experiment with adjusting seating depth but I really want to stick around saami spec at least initially until I feel comfortable making adjustments outside of that. I know saami is very conservative and outdated but I'd rather walk first than come out swinging. I have my whole life to play around and experiment. Die adjusting instructions are where you start from. Then you adjust for your chamber, press, dies, and shellholder. I'm thinking you need to go about 1/16 turn down with your sizing die. A good rule to use for determining your charge weight increments is using 1% of usable case volume. With the .308 Winchester, your average load is somewhere around 40 grains of powder, so I use .4gr increments. 1 grain increments can put you in a place where the charge weight that was lower was fine, whereas the one a grain higher is over max. I never load in same weight batches anymore for initial development, but will do a string for pressure ladder analysis over a chronograph. None of the charges will be the same, all just in 1% case volume increments. That helps me see the trend line in how the particular powder/bullet combo builds pressure, and where it departs from being predictable. So if I am understanding correctly (in OP'S case for instance) you would load 1 round each starting at the minimum and working in .4 increments up to your max. Shoot that string over a chronograph, check for pressure signs and plot the velocities for a "profile"? Once you do that how are you figuring which charge weights to load more of and begin accuracy testing/developing? And what do you do about cold bore shots? Warm up the barrel first? That's my first thought as well, till I read that it was a Savage rifle. There are a lot of Savage 308 owners out there that are finding that their rifle has an extremely short throat. I would measure the chamber for Max OAL as well as check out the Full Length sizing adjustments. I also think the charge is to low. Lyman 48 with the 175gr Sierra HPBT START= 40gr.....MAX = 44.3gr R-15. This is with Rem Brass, check out the PPU cases for internal capacity in grains of H20 and compare to civilian brass like Remington. Sierra used Civilian Federal cases. Allinat web data list a Max charge with IMI brass and R-15 at 45gr.with their 180gr bullet. It is important to know that Sierra data is not pressure tested and tested in "pressure barrels". They test their loads in regular rifles, then read the brass case, look for pressure signs, then guess on what their Start and Max load should be. I avoid their untested data like the plague. This site really helped Me, I need to work on following Dan's instructions a little better. Dan Newberry's OCW load development. "Max" is determined by your particular firearm. Going 1 grain over Max is not going to make any more difference than going .4gr over. I'm not knocking your method though I've never had an issue going with 1gr increments in the larger cases. I don't like wasting powder.